Anyone considering adopting a child will have a number of decisions to make before coming home with their new family member. While the actual act of adoption is seen as a universal act of love by both parties, the experience of adopting a baby can vary widely from taking in an older adoptee. Finding an adoption center that puts your needs and goals first will help in simplifying this complex system. A is 4 Adoption is proud to be an ideal substitute for any adoption agency in California, working one-on-one with birth mothers and prospective parents to create an amazing outcome for everyone involved. Our company was started after the owners went through the domestic adoption process themselves, dealing with the red tape and regulations that serve to protect children which sometimes also end up keeping them out of the arms of waiting and loving parents. Finding suitable babies for adoption can be far different from adopting an older child. Today, we’ll look at a few of these differences, as well as a few similarities that serve to warm your heart. If you are considering adoption, or you’re in need of quality birth mother help, be sure to reach out to us to learn more! Today, more than 400,000 children are in foster care across the United States. While numerous agencies work to place these children into loving homes, the amount of time it takes to successfully complete the adoption process often hampers progress.The high volume of children in need of loving families makes adopting a child arguably one of the most rewarding experiences one can enjoy. Below are a few advantages that come with growing your family with an older child. One major and obvious difference in the adoption process when it comes to the age of the child is how long the new parents will have to wait on average. The high demand for infantile adoptions makes our approach a more time-consuming process. There are scores of older children currently waiting to be adopted into a loving family, creating more opportunity for parents who are hoping to expand their families. If you decide to adopt an older child, you’ll provide the support they so sorely need while feeling great knowing that you are making a life-changing difference in his or her life. This can prove to be a very rewarding experience! Announcing the adoption. At one point, you may choose to inform your child about their adopted status. While this can be very challenging, the long-term benefits of telling the truth make this difficult process worthwhile for many families. Talking about the birth parents. Everyone seeks a sense of belonging, and learning about your beginnings can help greatly in this task. The level of information you want to divulge about the biological parents can be tricky, and every situation is unique. Knowing about where you came from, though, will help to heal and move on. Older children will more than likely remember where they came from and the history of their early years. This can be polarizing for adoptive parents, as having this knowledge may help greatly in overcoming emotional and physical obstacles. Despite the pain and grief many children have to work through, having a supportive family that understands the problem will prove wholly beneficial. The joy of raising a child is hard to beat, but many adults are glad to be past the baby stages. From frequent bottle feedings to diaper changes and doctor visits, babies require a lot of time and attention. Adopting an older child will have its challenges, but they will be better prepared to join in your family activities and plans. Adoptive parents who are planning on living active lives over the next decade can benefit from skipping infancy and moving straight into bonding time with their new miracle. The act of adoption is an amazing endeavor that is done to serve the best interests of the birth family, adoptive parents, and child most of all. Adopting a child may prove challenging, but the reward and enjoyment of raising someone that isn’t your biological offspring should make it all worthwhile. 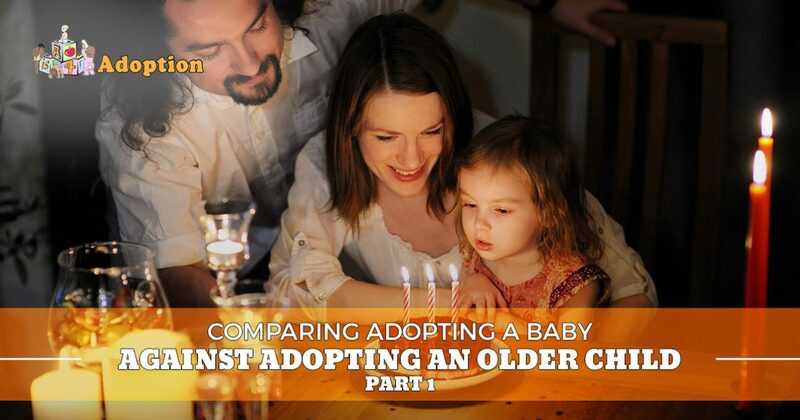 Next time, we’ll continue to compare older versus younger adoptions by discussing the benefits of adopting a baby. A is 4 Adoption is proud to be your go-to adoption center in Costa Mesa. Founded from experience, our center strives to cut through the red tape and deliver more children in need into the arms of more loving families. Our professional and friendly staff are always here to help you any time of day. Unlike any adoption agency found in California, our organization strives to deliver personalized service with unbeatable help for birth mothers. Contact us today to learn more about our domestic adoption services!